Let me first present my situation: I usually go out biking with my girlfriend - during which time I create track logs with the help of a Garmin GPSMAP 60CSx which is affixed to my bike's handlebar. However, sometimes there are forks in the road and these forks eventually join again and I was wondering if during these times she could record the alternate track as well. She owns a Samsung Galaxy S Android phone so I'm looking for an Android app which would ideally have minimal battery consumption but could be relied upon as a track recorder. I don't have any requirement to upload the track logs from the app, I can easily connect the phone after we get home and get the file from the SD card. There's a quite a few apps out there and most are listed on the osm wiki. I would personally recommend osmtracker for android . It's free and the interface is relatively easier to use than other ones that I've used (locus and oruxmaps). You can also set the frequency of how often (by time, in seconds) you want the points to be recorded and you can also see the OSM map layer on it. Regardless of what program that you use, the battery will be used extensively because of gps logging. I tried the app, it yielded surprisingly accurate results in urban areas. The battery consumption wasn't on the dramatic side either. Thank you. Conclusions one month later: I tracked shorter "workouts" (1h30m - 2h) on the bike with Endomondo and sometimes when reaching unmapped areas I started up OSMTracker concomitantly. The battery consumption remained reasonable and the tracks were very nice. I repeat: surprisingly good results for a phone. Thanks for the recommendation. Probably, the two best apps have been listed already. I'd like to give a quick reference for new users, to simplify choice. GPSLogger has a very limited functionality: it records the track of your movement and can put it online. No POIs, limited comments. However what it does it does really well. It's one of the best Android apps I've seen in general. It has a beautiful and very clean interface. It is very simple to use. The settings are exactly the ones you are likely to want. There is a distance filter, so that you don't get too many useless points. You can set the time interval between successive points. And importantly there is an accuracy filter to get rid of outliers. While recording a track, you get a quick summary with the number of points, distance, time, speed, average direction and your current position. Once the track is ready, uploading it to your OSM account is a matter of one button click. 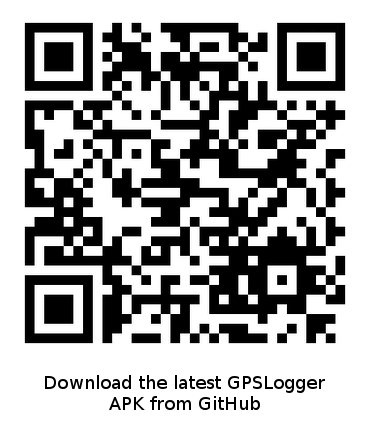 GPSLogger works very well with OSM, but it is not OSM-only and supports also logging to KML and text files, uploading to Dropbox, Google Docs, and FTP. The app is designed with battery saving in mind. Basically, this program can only save tracks—but it does it perfectly. OSMTracker takes a different approach. Once you start logging, you get a screen with 12 (!) buttons in front of you. From here, you can make voice records, take pictures, add text notes as well as add OSM POIs. I would say it should be a good app for advanced OSMing. However personally I found it too complicated for simple tracking. Note that you can customize the buttons in OSMTracker. I've got a set of 59 buttons in four groups to describe hiking trails and the things you encounter along them. At the other end of the complexity scale, I've got a button "set" that consists of a single button: voice record. Great for when you don't have time to navigate your way through a menu tree. @Carnildo, this is what I was looking for, and was entering speed limits by hand instead. I must have overlooked it. Thanks for pointing out to the existence of this feature. 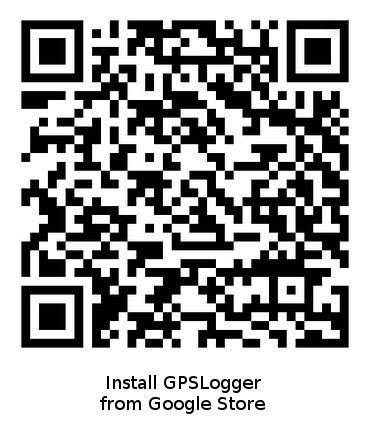 I'd recommend GPSLogger. One simple button to start/stop recording. It runs in background, so no interfaces and does not interferes with other apps. Tracks are recorded to memory card as .gpx and alternatively as .kml, so they can be directly imported into OSM. I figure it might be this GPSLogger app https://play.google.com/store/apps/details?id=com.mendhak.gpslogger as of the description of the app. You can try BasicAirData GPS Logger. It's a simple and lightweight logger for Android, it works offline and in background. Accurate and quite battery friendly. 100% free and OpenSource software, no ads. It's installable from the Google Store (QR-Code), or you can directly download the APK in Github (QR-Code). You can find some documentation Here: a getting started guide, some application notes, a support forum, and an article that deeps some background technical aspects of the app. This app is compatible with Android 2.2 and newer. 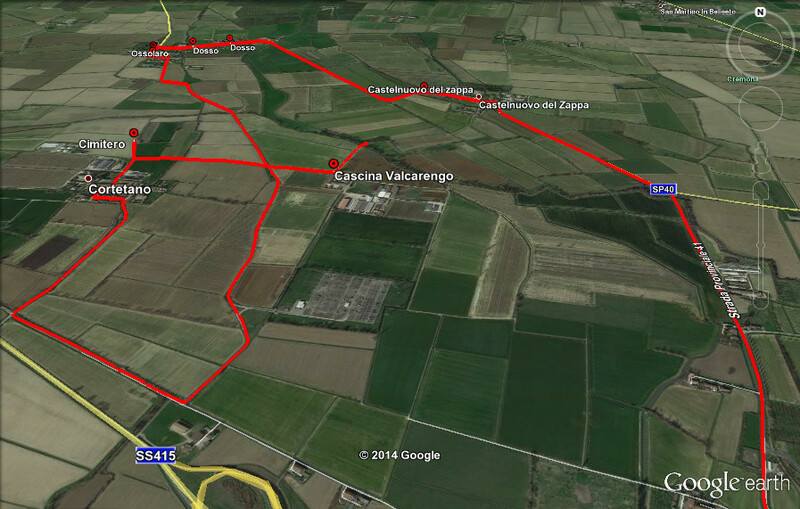 A track recorded with GPS Logger, viewed using Google Earth. 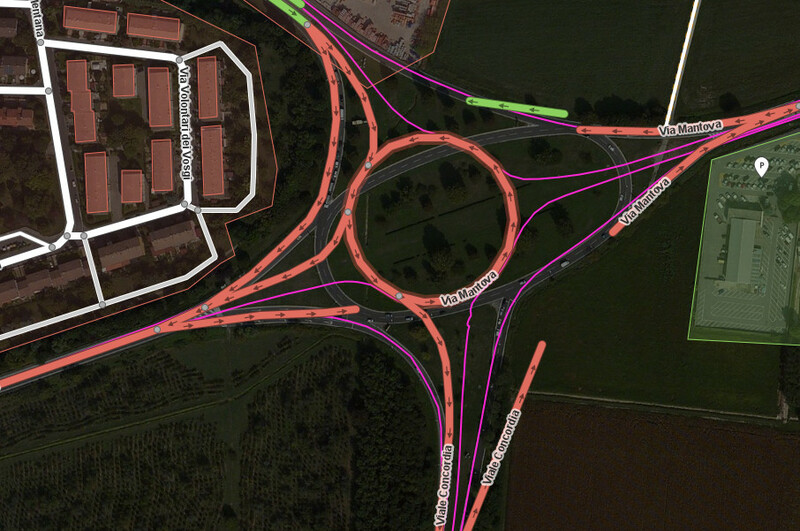 A track that I logged to update a new roundabout in OpenStreetMap. I was looking for the same thing and realized that OsmAnd application has a plugin that enables recording GPS traces. I must also admit that I haven't started using that yet. This is my favorate way of doing it, because I often have OsmAnd open for other reasons, and it's nice to see what POIs and other stuff is already mapped. OSM notes can also be added via the app, and either left on the phone for later reference or uploaded for everyone to see. Like Temporalista I like GPSLogger, you can set the frequency to work well when hiking or when driving so you don't have too much or too little points defined. How to keep track of my mapping?